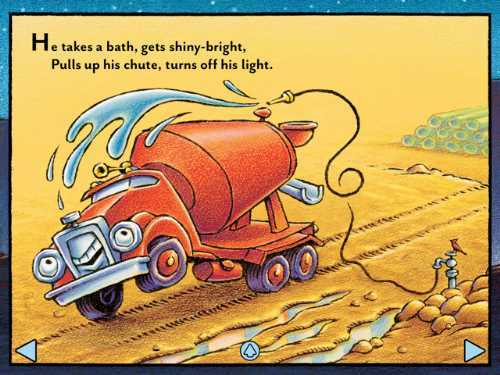 An adorable bedtime story about big, hardworking trucks curling up at night. 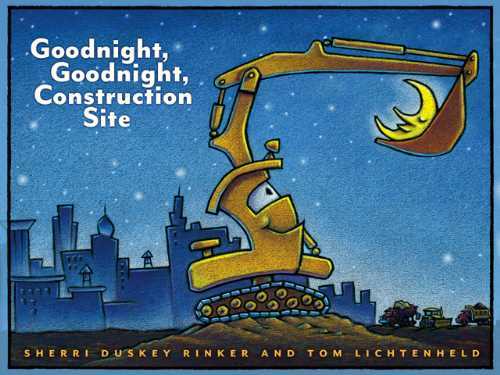 Goodnight, Goodnight, Construction Site is a book app based on the New York Times bestseller children's book of the same name, written by Sherri Rinker and illustrated by Tom Lichtenheld. The app introduces kids to five industrious trucks working at a construction site; and then shows readers how each one shuts down for the night and settles into sleep. Kids can explore this book app in two modes: "Read to Me" and "Read It Myself." If the former is selected, readers hear a talented narrator read the words as they highlight. The book is accompanied by a soundtrack of appropriate truck noises. Kids can touch any word to hear it reread. The original book's illustrations have been lightly animated so that dangling pipes sway and trucks move slightly, appearing to vibrate. Touching any part of the illustration will trigger a word description of the object and, perhaps, a special sound treat. If readers want to read the book without narration, the ability to tap on a word to have it read is still available. Kids also have an option to record themselves reading the book. This option also enables a parent or relative to share the joy of reading, even when they are far away. The app includes a table of contents, with the ability to jump to any page; and parents can control things like whether readers hear the sound effects and if they can tap on the pictures. 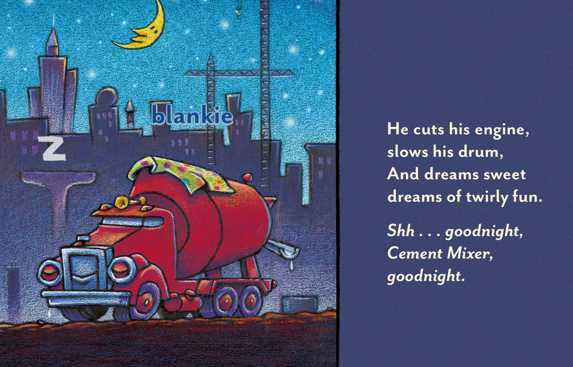 The story in Goodnight, Goodnight, Construction Site brilliantly imagines what animated trucks would do before going to bed; and children will identify with many of the routines. The cement truck takes a shower to clear off its dirt, while the crane truck turns on his nightlight and then snuggles with his Teddy bear. 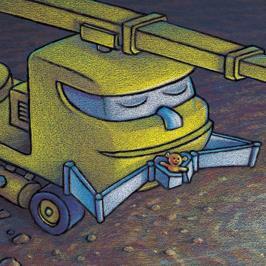 Readers will enjoy hearing the dump truck snore, and be tickled by the bulldozer's dreaming. 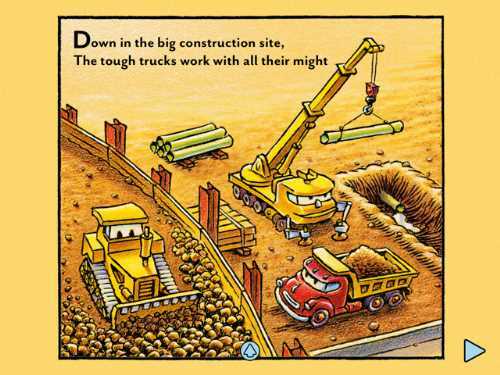 By reading this book app, kids will discover the role of each of the five trucks at a construction site. The text talks about the parts of each truck, and kids learn where each of those parts are by tapping on the truck's parts to see and hear its name. The illustrations are only slightly animated, but they are presented in a way to give the illusion of movement. Pulls up his boom, stretches his back. And snuggles up without a sound. 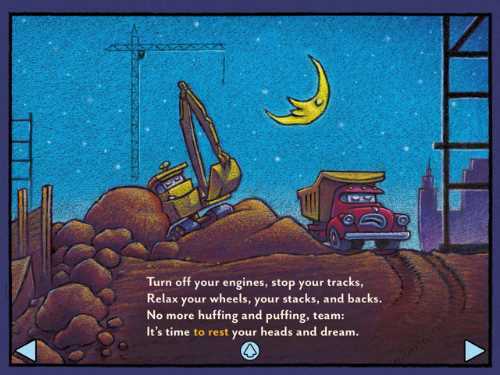 Goodnight, Goodnight, Construction Site is a great bedtime story app for children who love trucks. While we normally think of saying goodnight to each other, our animals, and even the moon, this app makes it fun to say goodnight to all the trucks in the playroom. For more apps about trucks and the work they do, check out our Best Picks rec list of kids apps called Construction Site Apps for Kids. This Goodnight, Goodnight, Construction Site book app review was written by Jinny Gudmundsen.